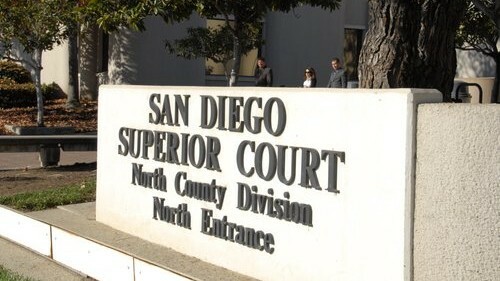 An Aug. 30 trial date was set Friday for a caretaker accused of throwing a 93-year-old woman through a screen door in Oceanside. William Sutton, 66, is accused in the attack on Margaret Wood, who lives in hospice care. Wood’s granddaughter-in-law, Lisa Wood, told police she found a video recorded April 16 that shows Sutton pushing Wood through her friend Marian Kubic’s screen door. A motive was not known. Family members said Wood landed head-first three steps below on the concrete porch, cracking her skull and breaking her nose. Wood is now relegated to a wheelchair and the 92-year-old Kubic, for whom Sutton was caring, died last month after testifying at Sutton’s preliminary hearing, according to authorities. Sutton pleaded not guilty today to attempted murder and elder abuse charges at his Superior Court arraignment. He faces 14 years in prison if convicted, said Deputy District Attorney Garret Wong. The defendant — who remains free on bail — will be back in court June 30 for a readiness conference.